Reasonable people demand reasons: "Why did the chicken cross the road? Why is the sky blue? Why is there air?" The "whys" of the unlimited are hard to grasp for us endlessly questioning types. This is because the Absolute Truth--although He contains all logic--is also beyond all logic. Lord Brahma, the exceedingly well-informed engineer of universal creation, once tried (unsuccessfully) to figure out Supreme Reality by himself. Finally, he was able to understand Krishna as "sarva karana karanam" ("the cause of all causes"). In other words, the ultimate answer to "Why . . .?" is "because Krishna wanted it." What does Krishna Himself say about that? Krishna tells Arjuna that He comes to deliver His devotees from repeated birth and death. He comes to authoritatively tell us--"I created you, here's who you are. I also created this world, and you don't belong here. Here I am, and here's what to do"--not just let us perpetually guess about the meaning of our lives. Many imagine God as cold, aloof, uncaring, power mad, domineering--all the things humans in positions of power tend to become. Krishna comes to dispel those notions, to give us a chance to relate with Him as He is, not as we imagine Him to be. 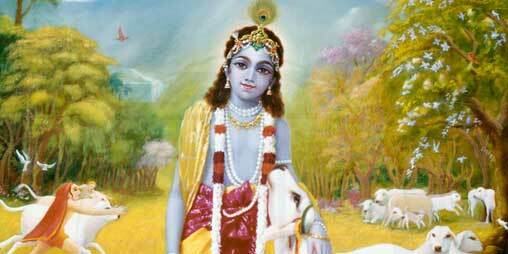 Like a loving parent, Krishna cares about us, even if we don't care about Him. We belong to Him. He's also within us--twenty-four seven, as Supersoul, guiding our activities--but that's apparently not enough. He wants to be involved in our lives. Why would someone want to be involved in the lives of people who don't want that? As the Supreme Person, Krishna is supremely social. We manifest our personalities in relationship with other persons. Krishna is complete in Himself; simultaneously, He has unlimited desires to relate to unlimited numbers of other people and thus unlimitedly manifest His unlimited personality. He is self-satisfied--He doesn't see "friends" and "enemies"--and at the same time He takes our indifference to Him supremely personally. This is why He wants our company, even if we don't want His. He doesn't force Himself on us. He wants our love, but true love can't be forced. To those fortunate few who want to see, He shows Himself--"Here I am! Remember Me? You used to love Me!" He comes to give a taste of the absolute, spiritual reality--"Remember this? this is what you're missing!" --one in which we are perpetually free to be ourselves, to be at our best, to develop deep, satisfying, spiritual relationships to the max without having to worry about impending death or taxes. We may have completely forgotten our true selves, Krishna, and our love for Him, still He doesn't write us off. He says that if we love Him, He will love us. Again and again and again Krishna comes to this world, in as many incarnations as there are waves on the ocean. Why does Krishna come? For His sake and for ours.